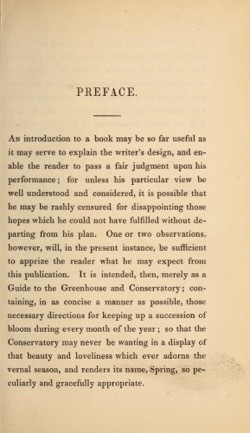 An introduction to a book may be so far useful as it may serve to explain the writer’s design, and en- able the reader to pass a fair judgment upon his performance ; for unless his particular view be well understood and considered, it is possible that he may be rashly censured for disappointing those hopes which he could not have fulfilled without de- parting from his plan. One or two observations, however, will, in the present instance, be sufficient to apprize the reader what he may expect from this publication. It is intended, then, merely as a Guide to the Greenhouse and Conservatory ; con- taining, in as concise a manner as possible, those necessary directions for keeping up a succession of bloom during every month of the year ; so that the Conservatory may never be wanting in a display of that beauty and loveliness which ever adorns the vernal season, and renders its name, Spring, so pe- culiarly and gracefully appropriate. 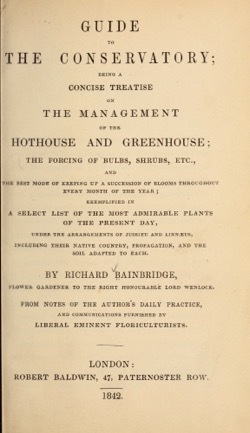 The Author’s next object is, to place within the reach of every student of the science of Floricul- ture, an easy and practical treatise on a select list of the most choice and admired plants of the pre- sent day ; so as to enable him to pursue his studies with pleasure, ease, and perspicuity, that he may fulfil the several departments of his office, without encumbering his time with those experiments ne- cessary to the attainment of so valuable a know- ledge. If the humble efforts of the Author’s pen have accomplished this end, he will feel himself richly compensated, in being enabled to contribute to the advancing of one step towards the acquisition of useful knowledge. At the same time, he begs to tender his heartfelt thanks to those useful cultiva- tors of Horticultural and Floricultural science who have so kindly aided him in his arduous task ; especially in furnishing him with the valuable in- formation given on the treatment of several par- ticular plants. Categorized under: Books, Education, History.